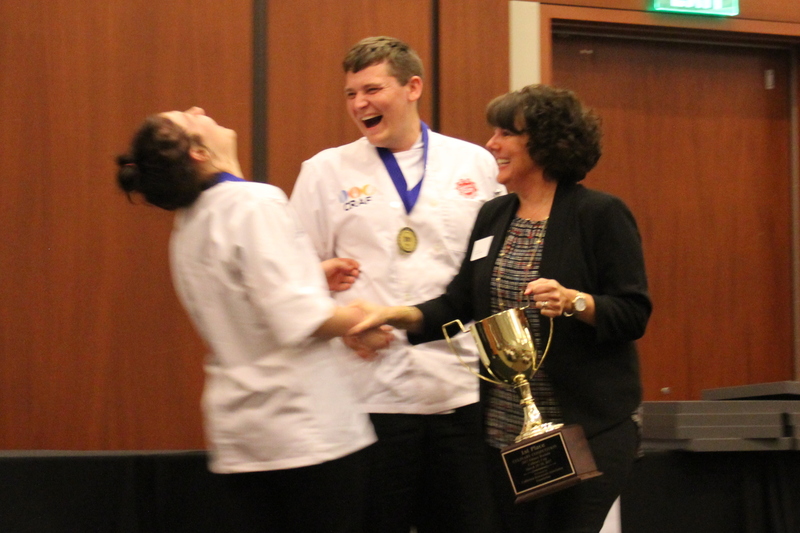 You might expect the winners of a California high school culinary competition to come from one of the state's restaurant destinations like Los Angeles, San Francisco or Sonoma County. 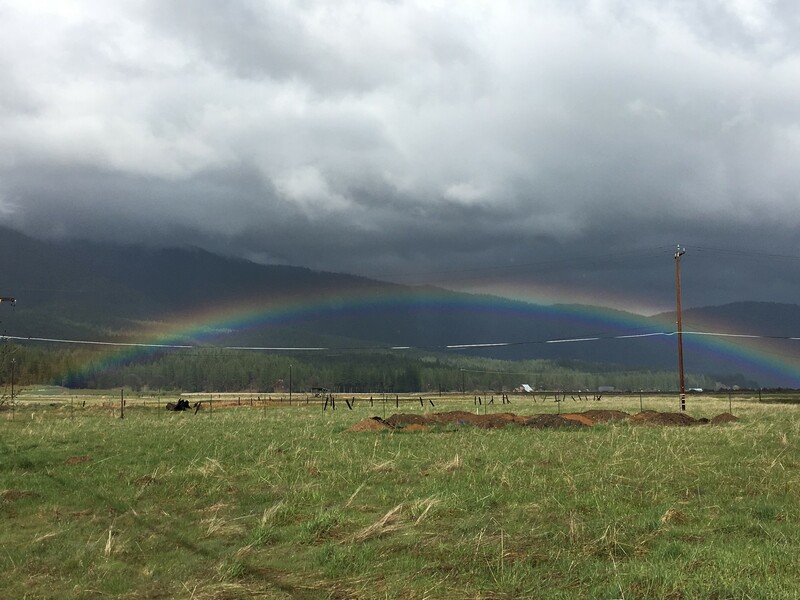 But a month ago, the top prize went to tiny Greenville High School in Plumas County. When the announcer called out, “Let’s hear it for Greenville!” the team of five walked onto the convention floor in Pomona looking like pros. Wearing chef coats, the students calmly navigated their 10-by-10 space -- and each other -- cooking their Italian-influenced meal on just two burners, and using only manual tools. No blenders allowed. They improvised when their pasta maker wouldn’t attach to the table and the burners ran hotter than the ones they'd practiced with. At the awards ceremony, it was clear the judges liked what they saw and tasted. When Greenville’s name was called for the championship, the winners stumbled up to the stage, laughing and crying in disbelief. A few weeks later, after spring break, the students are back at school practicing in a makeshift space in the teachers' lounge. Two burners sit on top of stacked folding tables, approximating the competition layout. They tell me about the dishes that led the California Restaurant Association Foundation to hand them the win, the ones they’re now finessing for the national championship this weekend in Charleston, South Carolina. Tanner Meigs describes the appetizer he’s making. “Authentic ravioli that has ricotta cheese on the inside with an arugula, sun-dried tomato and garlic filling. Then it’s coated with a brown butter sauce with shallot, sage, shitake mushroom and bacon,” he says. He’s cooked most of his life -- frying up his first pork chop with his grandfather at age 7. Before joining the culinary team, though, Tanner says he had eaten ravioli only out of a can. Now he makes fresh pasta in seven minutes. Chainy Carson is in charge of the entree, a fish dish. “It’s called all’acqua pazza, which translates roughly to ‘crazy water,’ fish in a broth,” with shrimp, calamari, crushed tomatoes and chili, he explains. 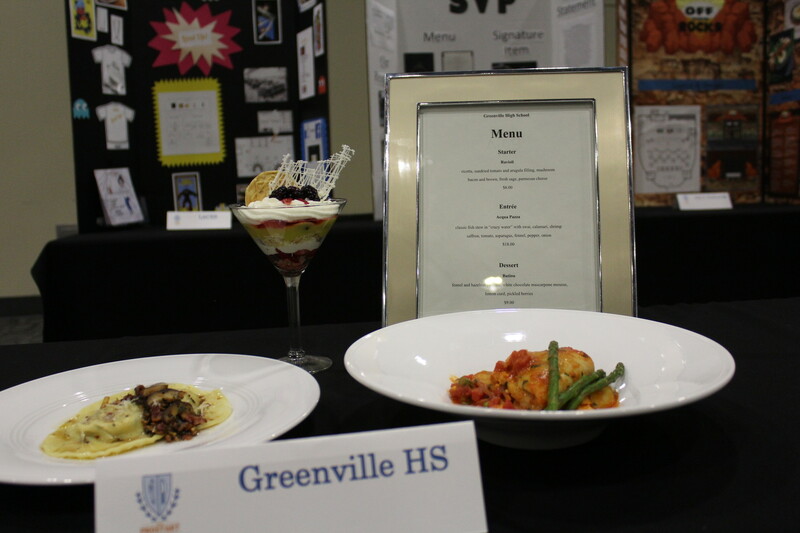 "Our dessert, the judge told us that we knocked it out of the park,” says Kelsey Heard who, along with Destiny Potts, is responsible for the parfait with lemon curd, pickled berries, fennel and a cookie. Sidney-Lyn McIntosh is the team manager, keeping the cooks on track. 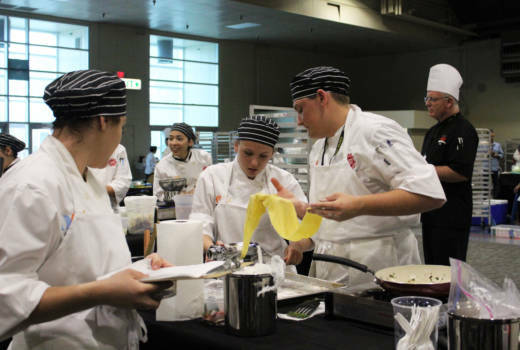 Before the competition, the team met every day after school and on weekends, sometimes cooking their meal twice in a row to make sure they could complete all three dishes within the allotted hour, and throw their hands up before time ran out. Their expectations were modest. “We kept telling ourselves: ‘Let’s be top 10,’ ” says Tanner. They were prepared, not just for the hour of cooking but for less subjective categories like paperwork. Chainy, who will study biology at UC Santa Cruz in the fall, did most of the calculations. "For the menu pricing and ingredient cost. It took forever," he says. But they did really well on those criteria. “The power of math,” he says with a laugh. The students say: it was obvious which teams at the state competition came from bigger -- or better-funded -- schools. “Other schools brought people to cheer them on,” Destiny tells me. “They had signs and they were all wearing the same shirts. We had three people watching us" -- their teacher, their mentor chef and one mom, chaperoning the trip. When I ask him the significance of that, he responds, “I think it says that in the culinary world, as a metaphor, it’s not the paint you use, it’s the way you use it." The team is using a more expensive product, Chilean sea bass, for nationals. On the surface, this is an unlikely win. Only 1,200 people live in Greenville. Greenville is an hour and a half drive up the Feather River Canyon from Chico, in a beautiful valley that used to be filled with lumber mills. Now, Tanner says, “It’s more older people, retirement people, because there’s not many jobs around here." Greenville High’s population has shrunk, too: there are only 11 students in the graduating class. So in a town this small, what’s the food scene like? The school -- with 75 students in grades 7-12 -- doesn't have a lot of resources. 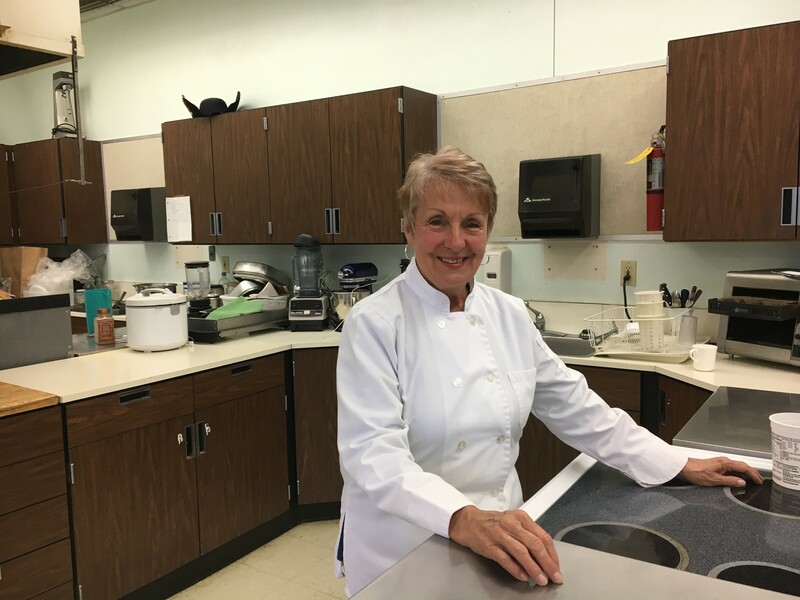 There’s been a culinary program here for decades, but teacher Judy Dolphin doesn’t have a big budget. To buy ingredients, she and her students hold breakfast fundraisers each Tuesday and cater events for local weddings, the fire department, Trout Unlimited, Friends of the NRA. She also buys flour and other bulk items at big stores two hours away. Like a lot of the adults in the school system, Dolphin multi-tasks: She also coaches cheerleading, and teaches the leadership, yearbook and computer classes. Students wear many hats, too. Chainy started a Dungeons and Dragons club. “It’s been running strong for a couple months now, and I’m pretty proud of it,” he says. Tanner breeds goats and has one big love everyone knows about. “He’s a rodeo geek, a rodeo junkie,” they all say in unison. The whole culinary team is in band, and four of the five play sports. With a school this small, they kind of have to. But the small population, the scant resources, the activities competing for their time -- maybe all of these factors actually led to Greenville’s win. “We’re all set with the mind game of how to win. All five of us," Tanner explains. And it shows when they cook. At practice, Chainy lets Tanner know his water’s boiling and ready for the pasta, then Tanner calls out “behind with hot pot” so no one gets scalded. Their teacher Judy Dolphin and a mentor chef from a local college advise them, but the students must make final menu decisions. Dolphin says that over the seven years Greenville has competed statewide, the teams have cooked Asian dishes, Italian, even a hyperlocal menu a few years back. Dolphin has had teams come in second place in the state championship twice before. She’s got high standards, and goes back and forth between gentle and more aggressive instruction while the students practice. “I’m being a drill sergeant today,” she says. The kids may roll their eyes a bit, but it’s clear: They’ve got a lot of love for their teacher. After that statewide win, the whole town went nuts. The school even changed the date of its prom, originally scheduled for the same time as nationals in South Carolina. The students -- two of whom have never been on an airplane -- say they’re just excited to be somewhere new, to taste Southern cooking. Dolphin says she just wants it to be fun for them. "The experience of being clear across the United States, putting your feet in the Atlantic Ocean," she says. She says that if they don’t place, it doesn’t matter. “I want them to learn from it, build their confidence, and put their hands up and say, ‘Done.’ On time,' ” she says, with a laugh.